For 16 years, Indigo, Rahul Akerkar’s labour of love, has defined fine dining culture in Mumbai. About time then that it made its much awaited foray to the capital. 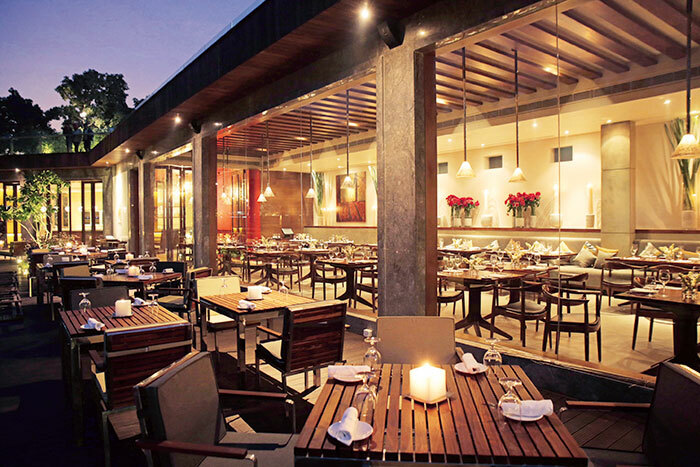 The Delhi restaurant is spread over an expansive 7,000-square-foot space, located in the leafy confines of the plush Musical Fountain gardens of Netaji Nagar. As you enter, the red corridor leads to two virtually different spaces on either side; to the right is the elegant main dining room, tastefully styled to suit modern dining and lit with ample natural light pouring in through the large glass panels; and to the left is the poised bar and lounge designed to exude warmth and style with chic full length windows opening out onto the outdoor deck. In the centre of the property is the massive 80-foot fountain overlooking the al-fresco tables, taking the dining experience to a dramatic new level. Beside the fountain, the rustic open-air gazebo dressed with grapevines weaving through the wooden structures creates a gorgeous setting for private dining for up to 12, complete with its own outdoor cooking section. On the upper level is the grand private dining facility, open to the sky, which can be booked for banquets and private functions. Minimalist restraint and fine detailing maintain a taut balance between stark walls, concrete flooring, simple teak furniture and a few brightly coloured frescoed surfaces. Everything is designed to make sure that the food is the star of the show. While Indigo in Mumbai thrives on its old-world charm, the new eatery is contemporary and design-driven, with every space bearing its own unique treatment.